The session will begin with a presentation on "Arbitration - Lessons to be Learned from the Singapore Experience", followed by a panel discussion focusing on "Thailand Comparison ? What should Thailand Consider to Improve its Arbitration Environment?" 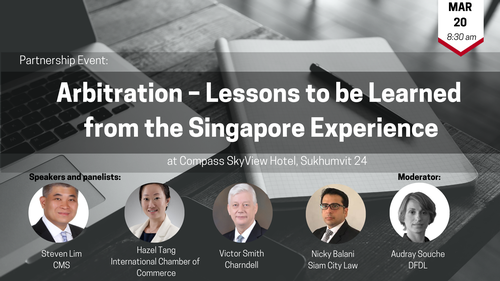 DFDL in collaboration with SIAC and CMS invites you to join this insightful session where you will gain insights on arbitration trends and strategies for practicing arbitration in Thailand and Singapore. Places are limited, so please be sure to register at your earliest opportunity for this session. This event is held in partnership with DFDL Thailand and open to all AMCHAM members.